Toshiba T235D – Glitzy or Glamorous? First impressions of the T235D are that it has a lot of shininess and gloss going on. Available in “Gemini" red, black, or white trim, we opted for the red model to shake things up. (This was before Dell shipped us the red Studio 14, naturally.) Crack open the lid and you're greeted by a lot of shiny silver, with a textured surface on much of the palm rest and border to help avoid unsightly fingerprints. It still gives the impression of a lot of bling upfront, but the red and silver combination are a nice break from the many black and dark colored consumer laptops. My first impression was pretty noncommittal, but as I've spent time with the T235D over the past couple weeks I've come to like the design and aesthetic more. The real question is what you think of the looks, but personally I'd have no problem carrying this laptop around to meetings, classes, etc. In terms of ports and features, the T235D comes with everything you would expect, but not much extra. There are two USB 2.0 ports, one eSATA/USB 2.0 combo port, Ethernet, headphone and microphone jacks, HDMI and VGA output, and a flash memory reader. If you're interested in Firewire, ExpressCard, or USB 3.0, you'll have to look elsewhere, but most consumers looking at an ultraportable should be fine with what's on tap. One feature that Toshiba includes that you don't always get is a powered USB port that can charge other devices even with the laptop powered down. iPod/iPhone/iTouch/iWhatever users could find this a nice extra, though if you're already carrying a laptop and peripherals it seems a small step to toss in your charger. 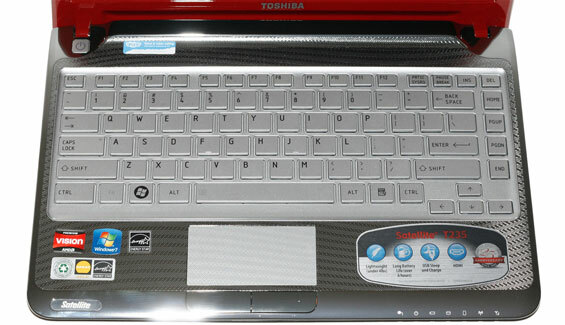 One area that I do like with the T235D is the keyboard size and layout. There's some difference of opinion on where the Fn key should sit, but I prefer the CTRL key to be in the bottom-left corner. I also like the vertical line of Del, Home, PgUp, PgDn, and End keys on the far right, with no funky Fn key combinations required. The touchpad works well, with support for multi-touch and two distinct mouse buttons. For those that find 12" and smaller keyboards too cramped [Raises hand! ], the 13.3" laptops strike a good balance between size and portability, and Toshiba makes good use of the available space here. It's easy to imagine students carrying the T235D around campus, as it's smaller than most textbooks without being too small for prolonged use by those of us with slightly larger hands/builds. In general use, the T235D delivers reasonable performance. It's clearly not the fastest laptop around, but it's a huge step up from netbooks and feels similar to the CULV/ULV Intel offerings. The T235D handled all the video decoding tasks we threw at it without issues, though the fullscreen 1080p YouTube videos we tested only played at around 18 FPS until we installed the 10.7 Catalyst drivers (more on that below). With the new drivers and the latest version of Flash 10.1, 1080p YouTube worked without problems—even on an external 1080p display—with CPU usage of around 50%. Of course, 720p is the more likely metric considering the native panel resolution, and that worked fine with even the older drivers. Watching a 10Mbit 1080p x264 video using Media Player Classic Home Cinema also worked great, with CPU utilization of just 15%. Like most ultraportables with integrated graphics, gaming performance is still typically too slow to be useful for anything more than light gaming. StarCraft II does put up reasonable numbers at low detail and native resolution, but it's the only game in our test suite that managed to get above 20 FPS without dropping down to a lower resolution. In comparison to Arrandale ULV's IGP, it looks like the HD 4225 is still faster, but not by much; it also has better driver support in games, though Intel has improved there as well. Unfortunately, if you're looking for a more potent IGP from either company, you'll want to wait for Intel's Sandy Bridge and AMD's Bobcat architectures (and AMD Fusion as well). It would be nice if the next generation of IGPs could target something like NVIDIA's G320M as a minimum level of performance, as these 40 stream processors (AMD) and 10/12 core (Intel) IGPs are woefully outdated. In terms of complaints, outside of personal opinions on aesthetics, the only real issue we have with the T235D is the plastic construction. The keyboard has some very slight flex if you press hard, and so does the palm rest, but it's nothing major. Build quality is about the same as other plastic consumer laptops, though we'd rate this one as better than the typical Acer offerings. We also dislike the Toshiba stance on AMD reference drivers. In response to our inquiry, we received the following information: "Although TOSHIBA does not participate in the Catalyst program, we do have the Catalyst Driver installed on our laptops with ATI solutions. We have not received any complaints as it relates to drivers or performance issues on TOSHIBA Laptops with ATI solutions." Well, I have a complaint in that the current 10.4 era driver Toshiba is using appears to lack full support for Flash 10.1 acceleration, and they try to hide ATI's Catalyst Control Center (i.e. it's not on the desktop if you right-click, and there's no icon in the system tray). Anyway, if you have access to another laptop with ATI Mobility Radeon graphics, you can use the ATI utility to download the driver package and it will install on the T235D without complaint. We used the Acer 5542 we reviewed a couple months back to accomplish this task, but a bit of searching on the web will likely turn up other options for getting the latest Mobility Radeon drivers. If the T235D was more expensive, we could levy some other complaints, but for the price it's a nice package. You don't get record setting performance or battery life, but there are no major shortcomings either. If Atom is too slow, CULV IGPs were lacking, and Arrandale ULV is too expensive, this is the ultraportable/thin-and-light laptop you've been waiting for. And if you act fast, Office Depot has a sale this week where the T235D is going for just $500 instead of the normal $580 to $600. At the sale price, this is an amazing bargain! We might as well cover a little subsection here on AMD's Vision Technology. The quick summary is that AMD Vision means you bought a system with an AMD CPU, chipset, and GPU/IGP. At the bottom of the Vision tier are standard "Vision" products. According to AMD, Vision systems will let you: listen to music, view photos, watch DVDs, watch movies and online videos, surf the Internet, and use email. In other words, any laptop sold in the last few years would qualify, including Atom if your definition of "watching online videos" is sufficiently broad, though obviously the use of an AMD CPU means you won't see Atom-based (or Core 2010) "Vision [anything]". The next step up the ladder is Vision Premium, which is where the T235D falls. Vision Premium certification means a laptop can: run several applications at once, play mainstream games, convert CDs to MP3s, perform basic photo editing, watch Blu-ray/HD movies, use a webcam. Again, that's a pretty broad stroke AMD's painting with, and defining "mainstream games" is a bit of a sticking point for us, but the capacity (with the appropriate BD drive) to handle Blu-ray does put this out of reach of non-ION Atom-based netbooks. In our testing, outside of the gaming aspect we would agree that the T235D meets all of the Vision Premium requirements, but we can say the same of the Dell Studio 14z launched over a year ago. The final two Vision levels, Ultimate and Black, generally indicate the presence of a discrete GPU (with DX11 support necessary for Black) and faster multi-core processors. If you don't want to know all the nitty-gritty details of a laptop's hardware, the Vision branding is a quick reference of sorts that lets you know roughly what a system can handle. It's a slightly more detailed take on Intel's Centrino branding, though we tend to prefer focusing on what a system includes rather than trying for such a high-level definition of hardware capabilities. If you want performance with gaming capabilities, a good Intel Core i3/i5 CPU with an AMD (or NVIDIA) GPU tends to be the best current solution, and such systems would fail to meet the Vision branding requirements. One thing that isn't addressed at all by Vision is battery life, which is one more reason to get into the fine details, but like it or not Vision—as well as Centrino—are here to stay. From page 2: "Unfortunately, if you're looking for a more potent IGP from either company, you'll want to wait for Intel's Sandy Bridge and AMD's Bulldozer architectures." => While the mainstream version of "Sandy Bridge" will have an IGP (coming in early 2011); AMD's Bulldozer won't. The one's with IGP are AMD's "Ontario" processor (Bobcat cores), and "Llano" processor (K10.5 based, Athlon II-like configuration + Radeon HD 55xx/56xx-based IGP)...These will be the Fusion processors that AMD will bring to the table in late-2010 and early-2011. Corrected. I said Bobcat in the other places (AFAIK), but I did mistakenly put Bulldozer in there. "The Turion II K625 processor comes clocked at a relatively tame 1.5GHz.... The K625 bumps the clock up to 1.7GHz while the K325 drops to 1.3GHz, making the K625 a good middle-of-the-road choice." I've been asking for a Nile platform review and Anandtech delievered! I'm glad that your reviewed the k625 too - it seems like the best Nile option, though the K325 1.3 is not much different. It was a good, balanced review. I've seen this one at Office Depot - it's been at $500.00 more than once now. If only Office Depot carried any color other than red. The link from graphics to conclusion didn't appear for me, not sure if it was just a firefox hiccup or if it's missing. Anyway, good article. What is really interesting is the difference in graphics performance between the HD 3200 and HD 4225. Is there any underlying architectural difference, because with the same number of shaders I'd assume that the 3200 at 500mhz would beat the 4225 at 380mhz. I missed the page title for the LCD, which messed up the links. That's corrected now. As for the HD 3200 and HD 4225, they're very similar but 4200 series uses UVD2 while 3200 is UVD1. 4000 series is also DX10.1 versus DX10 on the 3200. Per clock performance of the 4200 appears to be higher as well, but I don' t know exactly what changed in that area. well, it'd probably be nice to have a better datapoint for the last generation AMD Ultrathin platform than that turd 'Ferrari One' It would also help us determine if the 4225 is really more powerful than the 3200 or if all those games are just handicapped by the slow Ferarri One processor.